Rookie defence attorney Phoenix Wright steps into a courtroom for the first time to defend his best friend in this adaption of Capcom’s hit Ace Attorney video game series! Rookie defence attorney Phoenix Wright steps into the courtroom to prove the innocence of his clients as a member of Fey & Co Law Offices. Although things look dire when his best friend, Larry Butz, is accused of murder, Phoenix is prepared to put it all on the line to find the truth and get a “not guilty” verdict. With limited evidence on his side, Phoenix uses the strength of his logic to turnabout these cases from the most unexpected of directions. Objection! What is this? This is a series blog, where we’ll provide informal and brief hot takes after each episode in a given anime series. We’ll be updating this every week after each episode, so please check back for more thoughts! If you’re reading this for the first time, scroll down to the bottom for the first episode! This was a marginally better episode mostly thanks to the fact that the plot gets moving in a more substantial way, but this adaption still has some significant problems. Picking up on the tease at the end of last week’s episode, Phoenix returns to Fey & Co. to find his mentor Mia Fey lying dead, and her little sister Maya cowering in the corner. It alost would have been a more stylistically shocking choice for the murder to not have been teased in the previous episode, but this plot development still feels almost as shocking as it did playing through the game. Once again, the series makes it fairly clear that the murderer is someone unknown to us at this point, and the rest of the episode is taken up with Phoenix’s slow journey to end up defending Maya from the murder charges. It’s all pure set-up here, so those waiting for the real drama to hit will have to wait until next episode. Sadly, the pacing here was still not the greatest because the episode failed to convey the urgency of the situation at hand with any real force. This is a bit of an off-shoot of the weird lack of emotion that this episode displays - it came off pretty odd how unshaken Phoenix was the brutal murder of his boss to be honest - and this made boring watch with some tonal issues. Part of these tonal issues stem from the soundtrack, which continues to be a glaring weakness of this series two episodes in. The soundtrack felt oddly upbeat in some scenes (such as when they investigate the murder scene) that otherwise seemed like they would need the more serious or dramatic music that was displayed elsewhere. I wasn’t sure if this was supposed to be intentionally campy or not, but it didn’t jive well when the episode wanted us to take the story more seriously in other scenes especially when these scenes were consecutive. There were a number of jarring transitions in this regard as well, and I’m not too sure what the production staff were thinking in trying to piece this episode together in a tonally consistent way. It could be just me, but I thought that the animation in this episode looked a little bit stronger compares to the first in making the faces look a little bit less flat. The more zoomed out shots are definitely still on the uglier side though because of a clear lack of detail, but overall I’d say this episode was a slight improvement in this department. This show definitely isn’t a looker by any means, but hopefully this slight improvement will persist heading into the upcoming episodes. Hopefully the show will be able to do the same with its serious tonal issues as the story gets going in a meaningful way, and I’ll be very interested to see how the first court scene with the training wheels off will go. In one line: This was a better episode thanks to the plot getting moving, but there are still some really weird tonal issues. I had fairly low hopes going into this series, and unfortunately this turned out to be a wise decision judging from this episode. The episode follows Phoenix throughout his entire first trial as he defends his best friend, Larry Butz, in a fairly rote series of events meant to introduce the setting of the series without really surprising the viewer in any way. In the interest of disclosure, I’ve played every game in the series (hence why I’m using the English names, and thankfully Crunchyroll has an alternate subtitle track to accommodate this) so I’d like to think I have a general understanding of Phoenix Wright as a series. Now as they say, if there’s something that smells, it’s usually the Butz, but there were a number of things that stunk about this episode. Sadly, the entire thing gives off a thoroughly uninspired feel, managing neither to excite me or get me interested in the story line. There’s a distinct lack of energy that seems to permeate this episode - between the animation, the music, and the pacing, there is an impressive blandness which I was shocked to see. I get that this is a low-budget show for A-1, but it wouldn’t have hurt to incorporate just a little more of the visual flair and wackiness that the series is known for. This extends to the music, which generally stays in the background, and is thoroughly unremarkable in complementing any of the events of this episode. Oddly enough, even though the pacing failed to convey any of the earnestness or dramatic flair you might expect from an anime adaption of court, this episode still felt rushed regardless. This was likely due to the cross-examination feeling under explained in general, and although there were some interesting dramatic choices such as Phoenix being flung back as his accusation was countered, the entire sequence proceeds at an uninspired pace. Hopefully when the trials become a little more dramatic this will be rectified, but I’m not really feeling hopeful after this episode. I suppose this final paragraph should be devoted to the OP, because unfortunately, it’s quite terrible. At one point in this episode, Phoenix says “The 20th century was a long time ago, Larry” but you wouldn’t know it from the opening song, which is just a weird choice overall that ratchets this episode’s camp factor up a couple of levels. When that is combined with Phoenix and Edgeworth playing a metaphorical tug of war game using chains and the couple of skipping scenes which follow, we get one of the most oddly constructed openings I’ve seen in a while. I suppose this all ended up being a little bit snarkier than what I was going for, but I’m not sure this episode really deserved anything else especially when it comes to a series that I’ve loved for a long time. In one line: This was rather boring and uninspired, too bad. 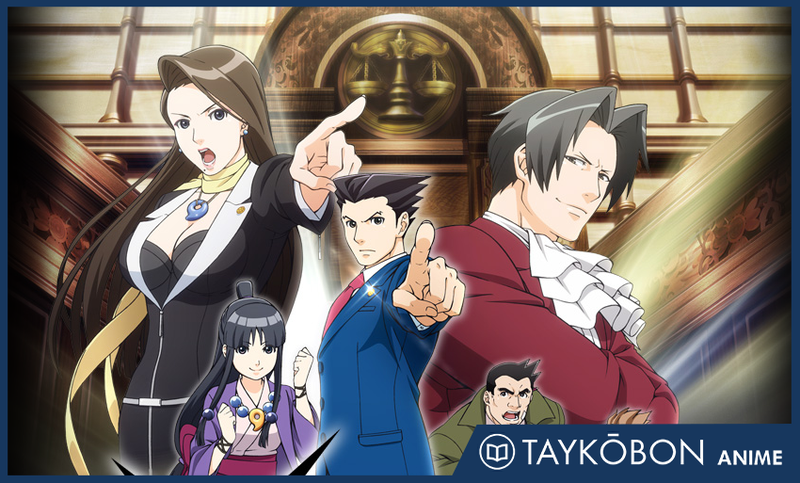 Phoenix Wright: Ace Attorney (Gyakuten Saiban) is produced by A-1 Pictures and is airing during the Spring 2016 anime season. Directed by Ayumu Watanabe (Space Brothers), the series is an adaption of Capcom’s popular Ace Attorney series of video games. The series will run for one cour, with the number of episodes to be announced.